This RC toy car allows children hours of fun racing the streets! The easy-to-use remotes have simple controls, so children can focus on having fun while they develop their hand-eye coordination and motor skills. Friendly plastic material, safe and reliable, non-deformation. Designed to be safe without any sharp edges. Built for long-lasting fun and entertainment. The car goes backward and forward, steers left and right. Mini size and cute, modelling novel and special detailed processing. 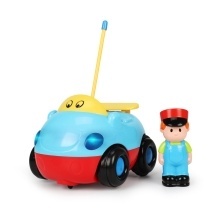 Colorful car with music and light, will catch your child&apos;s attention. Kids can develop hand-eye coordination. Dear friends, please be noted that you need to prepare batteries yourself to use this item.